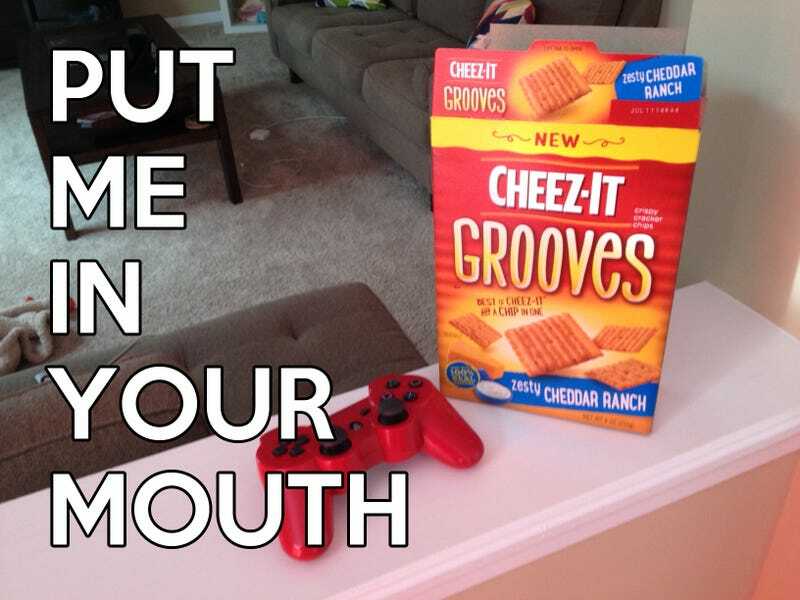 Nothing goes quite as well with long stretches of gaming like a tasty snack. So when I came face to face with Cheez-It's newest culinary creation at my local super market I knew I would have to put them to the test. Feeling lazy? Good. Let's begin. - Taste. It certainly has a wonderful zing to it. - Lack of cheese dust. Nothing is worse than smudging up your controller. - It's really more like a chip than a Cheez-It, which in this case is a good thing. - The grooves. They feel good in my hands. Easy to grip. - Two flavors to choose from. Zesty Cheddar Ranch and White Cheddar. Be nice if there were more, but it'll do for now. - You only get 9 oz for roughly $2.50. I get 13 oz of normal Cheez-Its for that same price. I want more bang for my buck you greedy cracker people.